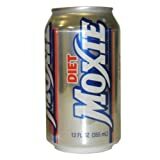 Moxie Soda is reported to be the oldest continually produced soft drink in the USA. It was created in 1885 as Moxie Nerve Food. It also comes in a diet version that contains 15 mg of caffeine per 12 fl oz can. 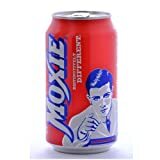 Moxie is popular in New England but can be found in other markets or online. Sugar content: 25 grams (per 12 ounces). Moxie Soda contains 2.00 mgs of caffeine per fluid ounce (6.76mg/100 ml).